The National Museum of African American History and Culture (NMAAHC) is a Smithsonian Institution that features the richness of African American experiences and stimulates informed dialogues about race. To enhance visitor engagement, C&G Partners designed a Digital Guestbook and Member Honor Roll kiosk that leverages the latest web-based technology with easy to manage user platforms. The kiosk digitizes key functions for visitor retention by combining an accessible front-end interface and secure back-end system. 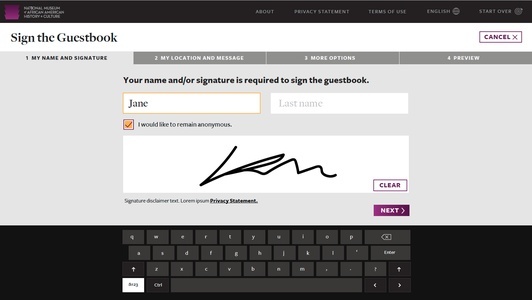 As users sign and share experiences in the Guestbook they can chart and search visitor’s geographic locations using a map. 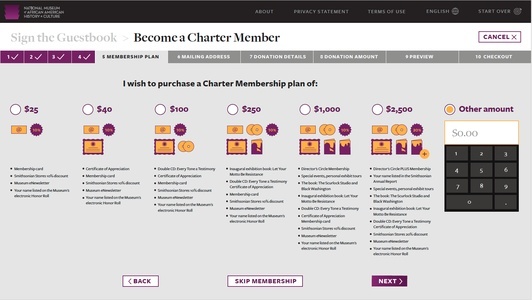 Facilitating the NMAAHC Charter Membership program is a key aspect of the kiosk, which is achieved through a clear layout of membership plans followed by a streamlined payment process. The system includes a searchable database for existing Charter Members. 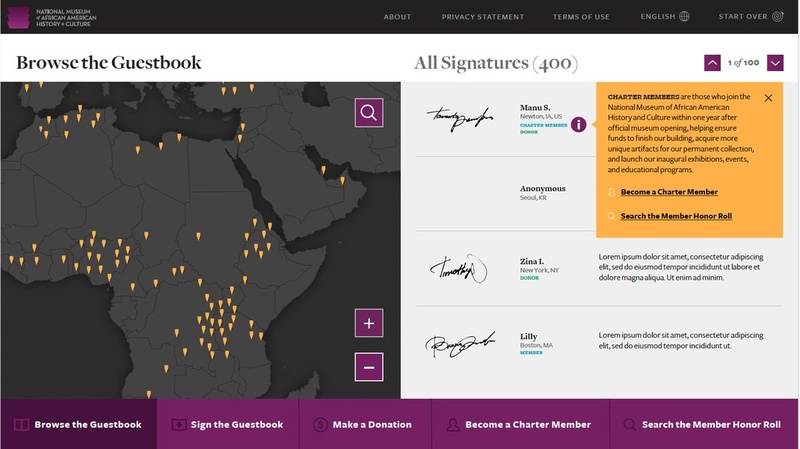 Users also have the option of doing a combination of the three primary actions—signing, donating, and becoming a member—in one easy streamlined form. NMAAHC is one of the latest examples of the digital guestbook project that can be found at up to eight locations across the country. Through the digital guestbook project, everyone can leave something of themselves behind.